THE WEEKLY B-MOVIE NIGHT BLOG: No Really, She's Chun-Li. Plot Synopsis: Brace yourself for the hard-hitting action and high-flying excitement of Street Fighter: The Legend Of Chun-Li including an all new unrated cut! 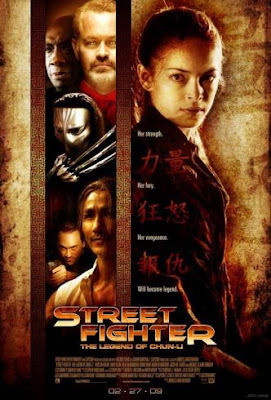 Based on the wildly popular Street Fighter video game series, this powerful martial arts adventure explores the origins of the Street Fighter universe through Chun-Li (Kristen Kreuk), who avenges her father's death at the hands of Bison (Neil McDonough) and his evil Shadaloo Empire. Now the stage is set, the challenge is clear, the legend will be forged...but who will prevail? Round One. Fight! -IGN gave the movie 1.5 stars out of 5, saying "There's better staged and more enjoyable brawls between Peter and the Chicken on Family Guy." They also stated the original live-action Street Fighter film was more enjoyable than The Legend of Chun-Li.